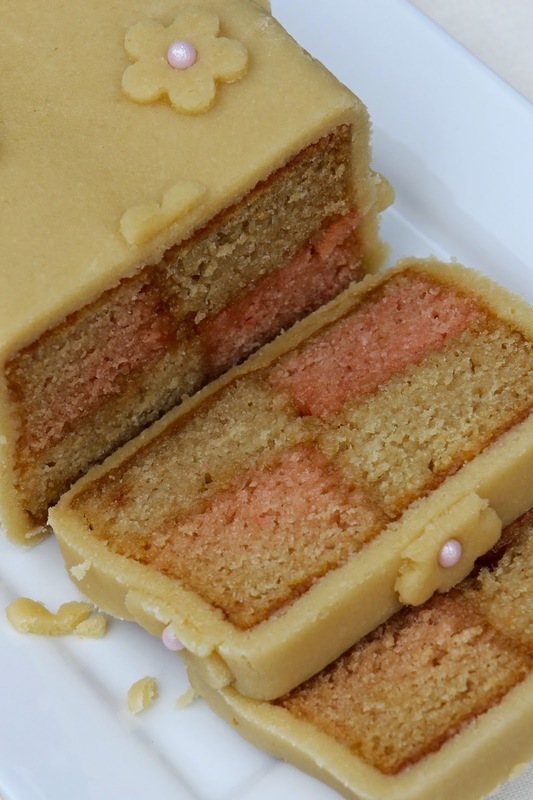 Battenberg cake is one of those very British delights which is instantly recognisable. Its traditional, characteristic chequerboard sponge in pink and yellow, cloaked in soft almond marzipan takes me straight back to childhood. It's not that we had Battenberg very often when I was a child, but because the cake had such a defined image, it was unforgettable. 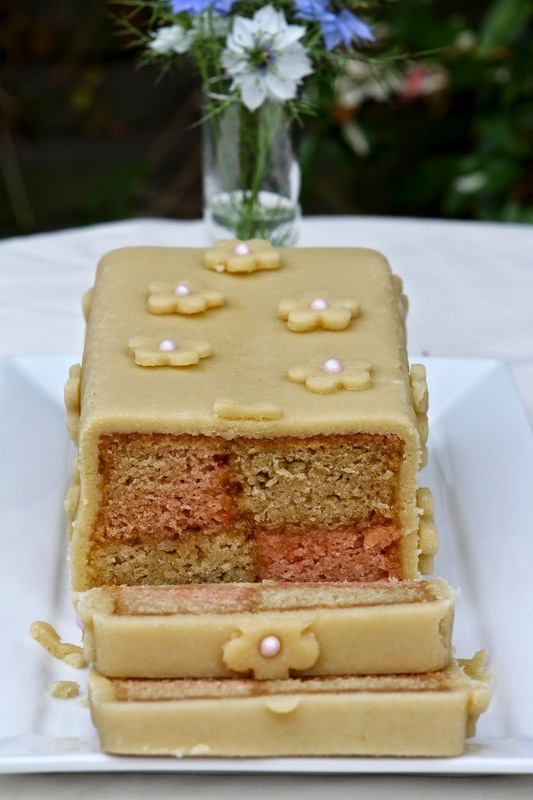 The first Battenberg cake is said to have been made to celebrate the marriage of Queen Victoria's granddaughter, Princess Victoria when she married Prince Louis of Battenberg in 1884. 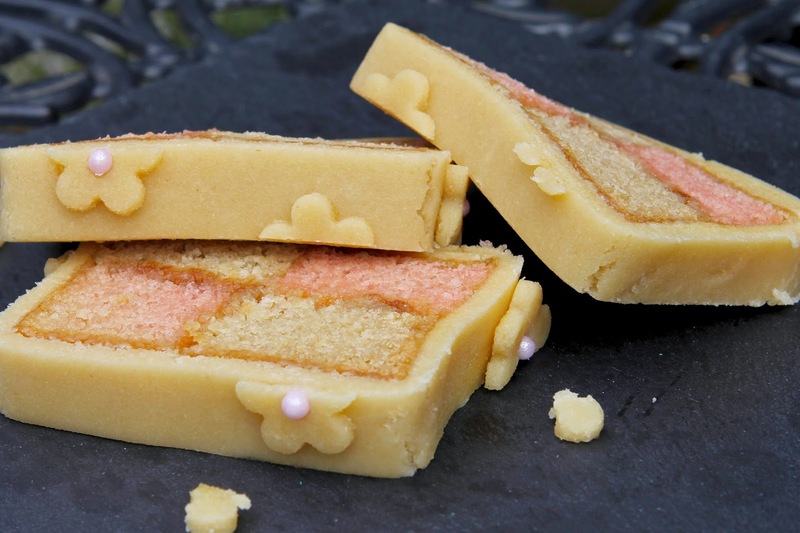 It is usually flavoured with almond and the characteristic design of four squares of coloured sponge are believed to represent the four princes of Battenberg. To be honest, as a child, I found the marzipan a little 'bitter', mainly because shop-bought versions of the cake always tasted a bit artificial and were probably made as cheap as possible. I would peel the marzipan from the edges of the slice and lick off the jam, then separate the squares of sponge and eat them one by one. As I have got older, marzipan has snuck its way onto my favourites list and is most definitely up there on a pinnacle for my husband. 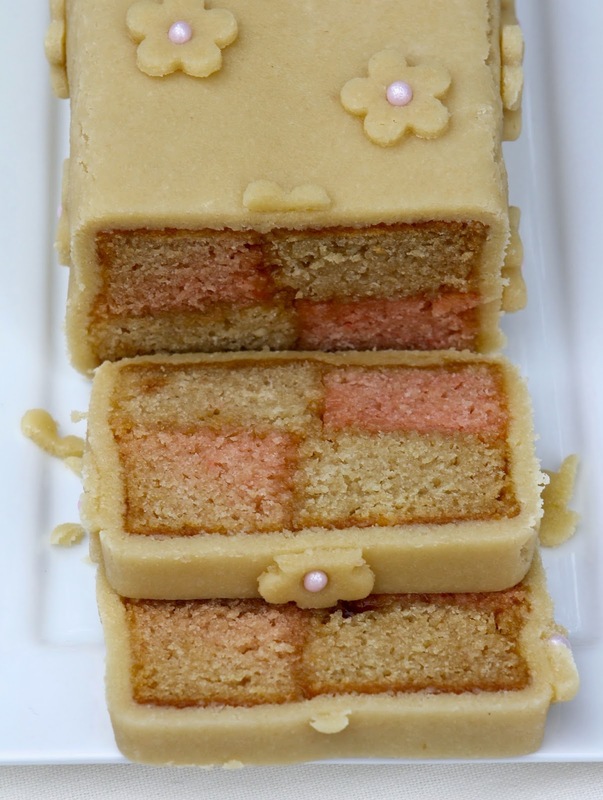 Being Father's Day last weekend, Battenberg cake seemed a perfect choice for a baking treat. This is my first attempt at making Battenberg and also my first foray into the world of home-made marzipan. The basic sponge design seems ripe for hundreds of variations of both flavour and colour as well as covering, but I wanted to remain as true to tradition as possible, albeit with a gluten free version. So my sponge is rich with both ground almonds and almond extract and is stuck together with a spread of the expected apricot jam. Really divine! This is (with the full agreement of everyone who has tasted it) the best Battenberg cake I have ever tasted. The sponge is dense enough to hold together perfectly when shaping, yet incredibly moist and balanced with just the right amount of almond. The apricot jam adds a fruity juice to each mouthful, without being so slippery that the cake falls apart. And the marzipan? Well........ it is soft, perfectly textured with ground almond, rich with almond flavour and surrounds the cake snuggly so that it not only looks neat, but each bite blends the contrasting textures in slightly sticky harmony against each other (if you manage to restrain yourself from reverting to childhood deconstruction of your slice). The sponge recipe is my own. The marzipan is not........ I had bookmarked a marzipan recipe recently posted by a fellow food blogger - Laura - who blogs over at 'I'd Much Rather Bake Than...', and this is the one that I used (the only exception being that I used a large egg instead of the suggested medium size). And Laura is right...... not only is it incredibly easy to make, but it is so absolutely better than the shop-bought stuff. Definitely superior in both texture and taste. I too will never be buying it from the supermarket again. What I found slightly confusing however was that after I made it, I decided to see what other recipes were around and discovered that there does not appear to be a standard process for making it. There are boiled varieties, uncooked versions and some use different sugars. I have no idea whether any of the others are better than this one (there seemed to be a few sob stories out there where attempts to make marzipan had gone disastrously wrong), but this recipe worked perfectly for me....... so I'm sticking with it. Thanks Laura!! Love Cake being hosted by Ness at Jibber Jabber. This month's theme is 'vintage'. Well, if a history of 130 years and roots with a royal wedding doesn't fit the bill, then my understanding of vintage is right up the creek! 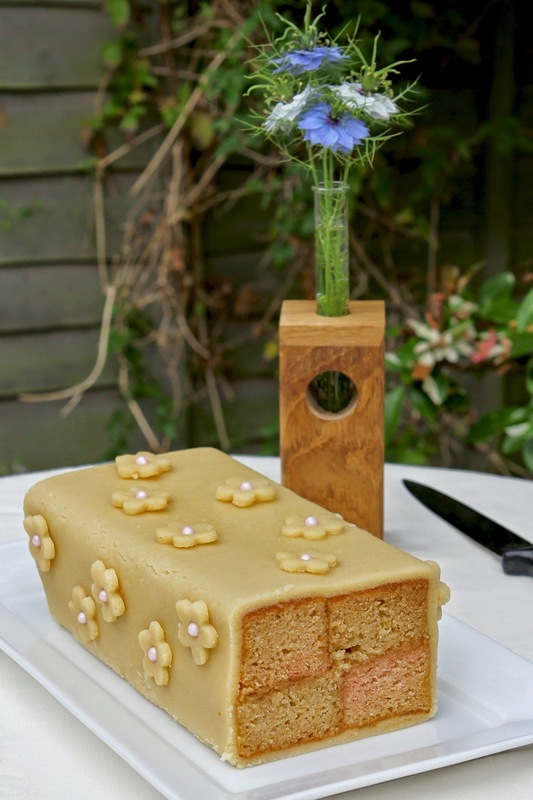 So here it is : The Best Battenberg Cake I Have Ever Tasted And It's Gluten Free! Prepare 1x 9 inch/23 cm square loose-bottomed cake tin, by base-lining with baking paper. Cut a thick piece of card to snuggly fit across the centre of the tin as a divider and cover the card with foil followed by a layer of baking paper. Divide the tin in half with the covered card, so that it is split into 2 oblongs. Alternatively, base-line 2x 9 inch/23 cm loaf tins. 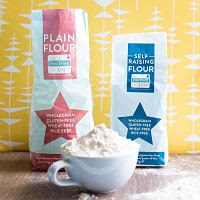 Weigh and mix together the flour, baking powder, bicarbonate of soda, xanthan gum, salt and almonds, making sure any lumps are broken down. Set aside. In a jug, measure the milk and mix with the vinegar. Stir and leave to stand for 10 minutes. Meanwhile, cream the butter with the sugar until pale and fluffy. Add the eggs one at a time and beat until well blended. Add the vanilla and almond extracts and beat to combine. Fold in the dry ingredients alternately with the milk-vinegar mixture about a third at a time until JUST combined. Spoon half the mixture into one side of the tin (or one loaf tin). Add a couple of drops of red food colouring into the remaining half of cake batter to the desired shade and fold until even in colour (be as careful as you can not to over mix). Spoon the pink mixture into the second half of the cake tin (or the second cake tin). Smooth the top of the cake mixture and bake in the oven for 25 to 30 minutes until a skewer inserted into the centre comes out clean and the top springs back to the touch. When cooked, leave in the tin to cool for 10 minutes and then remove the central partition from the tin. Carefully turn the sponges out onto a wire rack to cool completely. Once cold, wrap the sponge in baking paper and cling film and chill in the fridge for a couple of hours or overnight to firm up slightly which will make it easier to cut and shape. Weigh the almonds into a large bowl and sift in the icing sugar, stirring to fully combine. Add the almond extract and egg and stir with a flat knife to bring together until the mixture forms a dough. Knead the dough until smooth. Form into a ball and wrap in cling film until ready to use. Heat the apricot jam in a small saucepan over a low heat, or microwave on medium until warm and liquid. Use a pastry brush to coat the inside sides of the sponge lengthways, piece by piece, sticking together in a chequer-board pattern : pink and white next to each other on the bottom layer, followed by white and pink (opposite sides) on a second layer. Roll out the marzipan onto some baking paper (to prevent it sticking) so that you have a large square that will wrap around the whole of the cake. Brush some apricot jam onto middle strip of the marzipan and carefully place the sponge on top of the jam (using a spatula or palette knife to help support the sponge when moving). Brush the remaining long sides of the sponge with jam and carefully fold the marzipan up over the sponge, keeping it as tight as possible to the cake sides and sticking to the jam. Trim the marzipan to make a neat join and trim any excess marzipan at each end. Turn the cake over so that the join is hidden on the underside. 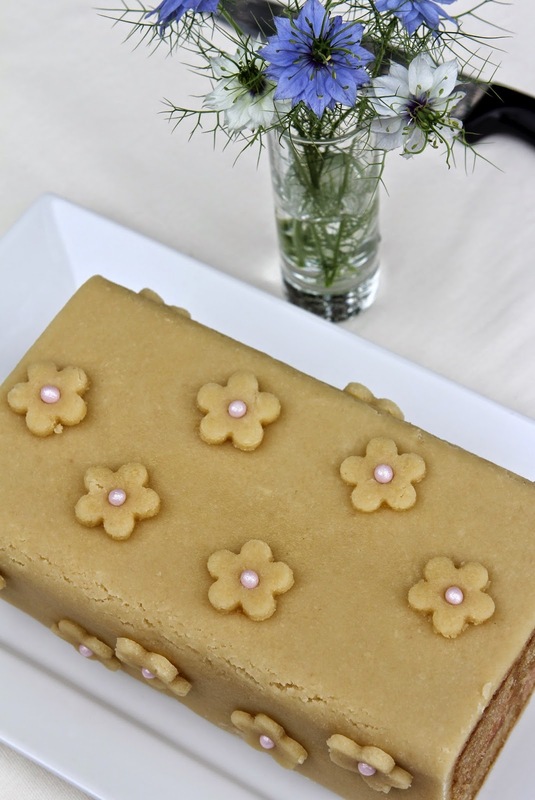 Use any off-cuts of marzipan to make decorative marzipan shapes (I made flowers using a cutter) or decorate the cake as you wish. Use a little jam to stick the marzipan decorations to the cake. Chill the cake for about an hour, before cutting a thin slice off each end with a sharp knife to tidy up. 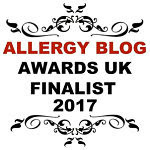 Thank you for all those links to my blog! I'm ever so pleased the marzipan worked out for you but it's you who deserves the credit - your cake looks beautiful and I love the addition of the flowers on top, like a touch of elegance and a stamp of your own on a classic cake. Besides making it gluten free of course! You're more than welcome Laura. It was a great recipe! I'm pleased I managed to construct a cake which looked good and tasted even better! Absolutely allowed - individual slices make for a fine petite treat. Thanks Kate! 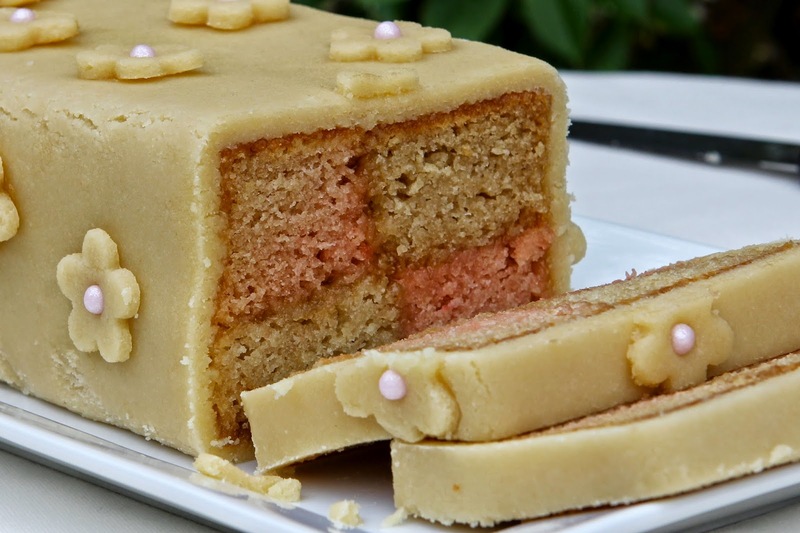 I had two favourite cakes as a child - ginger cake and Battenberg. 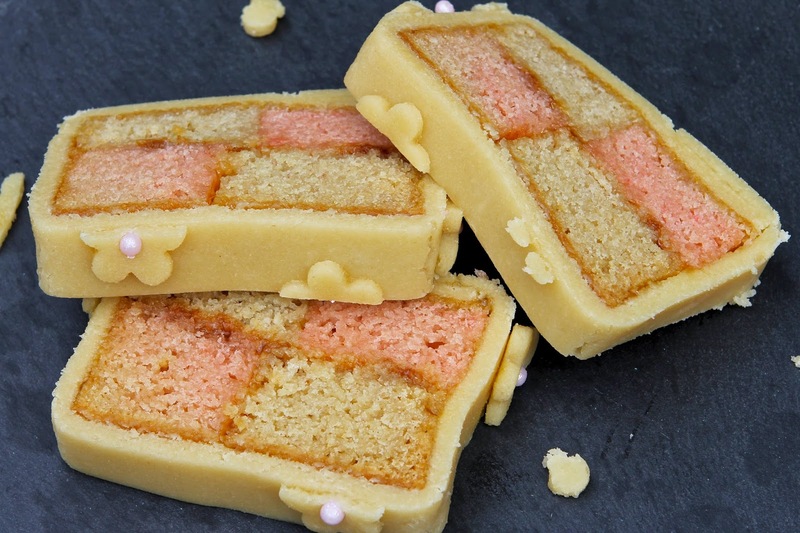 Still to this day I love Battenberg but I've never made one. I was going to make one for my Clandestine Cake Club last month but got struck down with a sickness bug the night before. There is only one way to eat it and that's breaking it up into the four pieces and eating the yellow squares first! It certainly passes my vintage test. Thanks for linking up with this month's Love Cake. You must try making it. However much you loved it before, home-made is so much better than the ones we used to buy! Thanks Katie. The marzipan was so easy to make, and tasted divine. It is absolutely to be recommended! Wow. You have made it so well! I have never attempted to make this cake and I have only tried the shop-bought version. The colours of your cake look natural and frankly much more appetizing then the industrial version! I'd love to try a slice! Love your decorations too! Thanks Alida. It is WAY better than the shop-bough stuff! I thoroughly recommend it! I love battenberg! I've been wanting to make it for ages... the way you've decorated it is just TOO cute. Looks absolutely wonderful! Thanks Aimee. 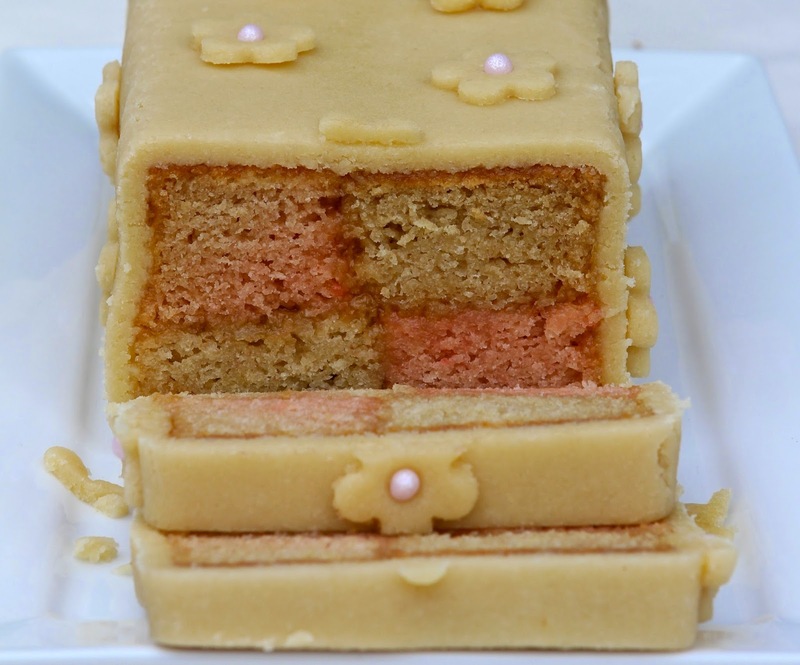 There is something quite delicious about the sweet almondyness of Battenberg. The flowers seemed the easiest way to use up the left over marzipan (other than nibble it, which I confess is where most of it went). But sometimes the simplest decorations work the best! Love the flower design, so pretty! Thanks for entering these into Treat Petite. Oh well done Kate, your battenburg looks fabulous indeed - heaps better than the one I tried making. I find bought marzipan way to sweet and prefer homemade any day. I've tried a few different recipes - one with a whole egg, one with egg yolk and one with egg white. Can no longer remember which is the best - doh! Thanks Choclette. I was pretty chuffed with the result. And I definitely have more plans for the marzipan too! 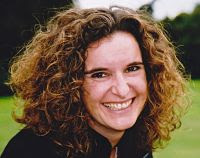 Hi Kate, have you tried keeping your battenburg for several days? Just wondering how long it can keep for as I'm looking for a recipe for gluten-free cake that will for 3 days or more! Thanks! Yes. It keeps well. If you put ground almonds in a sponge, it not only gives structure, but adds natural moisture which helps to keep it well. If making ahead of time for a party/event, I would wrap/cover in clingfilm and keep in the fridge and then bring to room temperature a few hours before serving (take out the night before is fine). This will help keep it fresh and shouldn't affect the moistness. Let me know how it goes!